An electric bike test ride is a vital element when considering a purchase. Customers are welcome to visit OnBike at any time during the day to view, test ride and discuss any aspect of electric bikes without any prior notice. It’s also an ideal opportunity to ask any questions, and really get to know what electric bikes are all about. 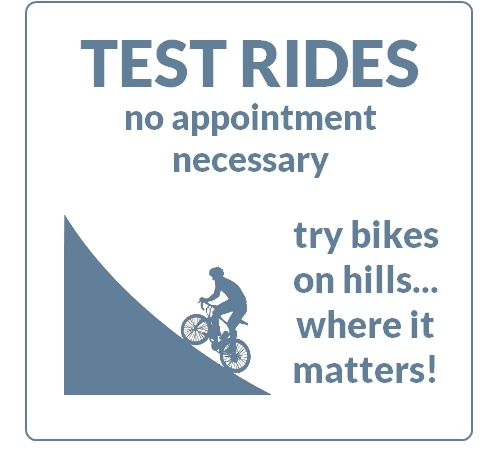 We’ve always been proud of being able to provide customers with a comprehensive experience before a purchase, so they can make an informed decision on the many different types of drive systems, motors and brands available, and take an electric bike test ride on hills in the area! Electric Bike Test Ride: Test Ride Between 15 & 20 Electric Bikes at Your Convenience…..! Whether you’re looking for a folding electric bike, electric mountain bike, or a tourer, OnBike guarantees to let all customers have an electric bike test ride before making any form of commitment to buying. This way, you won’t be in danger of making any snap decisions and hoping for the best! So do feel free to visit, request a test ride, and thoroughly get to know the bikes – you’re more than welcome! Which bikes are you interested in?